Organic squash has benefited from squash’s overall rise in popularity. Organic squash sales rose more than 25% in 2016 and made up nearly 7% of all squash sales in 2015. Some types of squash are often used as a pasta substitute in paleo-style diet plans, breathing new life into the category. Appeal to these already health-conscious consumers by including organic squash in your offerings. For more information on variety characteristics, visit our conventional summer squash and winter squash pages. Promote organic squash’s many health benefits along with its organic growing practices. Many consumers looking for squash are already health-conscious, so promoting the benefits of eating squash along with the sustainability of its growing practices may have broad appeal. While squash is most often associated with the fall season, many types of squash are available year-round. Don’t limit your squash promotions to just the fall. Promote organic zucchini and yellow squash during the summer grilling season as they make a great grilling partner. 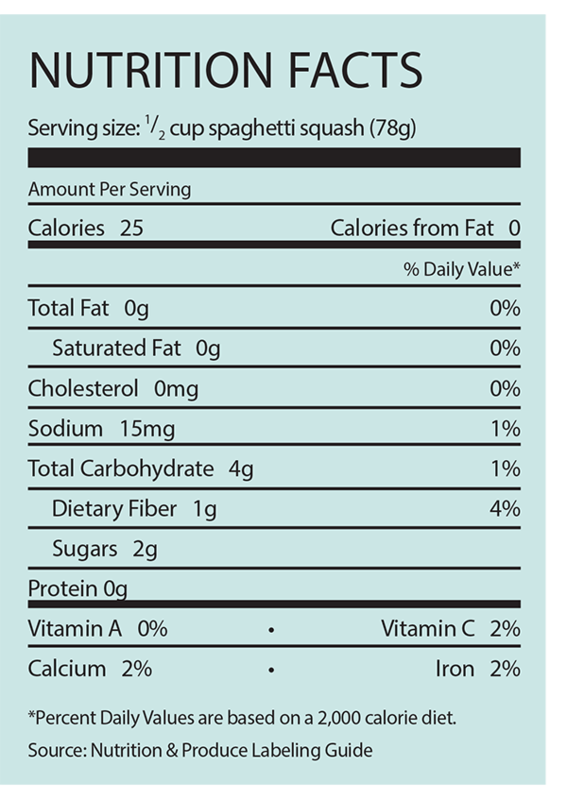 Promote spaghetti squash year-round as a substitute for pasta in wheat-free meals. Winter squashes make great soups and are perfect for stuffing. Many varieties of squash are available as organic, so include a variety on your display. Offer preparation tips and recipes and clearly label each variety. Experiment with offering different varieties to find the ones that work best in your store. Squash tends to take up a lot of space on the display so consider placing organic squash at one end of the display and conventional squash at the other end, with the appropriate barriers in between. This creates a large, eye-catching display that appeals to all squash shoppers. Organic squash can be stacked, but keep your stacks short as larger stacks will crush the squash on the bottom and create the opportunity for squash to fall of the display. Organic yellow and zucchini squash is a popular item for many consumers. Consider displaying it with other organic salad and cooking vegetables. Customers who might not be interested in other varieties of squash will find it more easily there. All types of organic squash are available in a variety of shipping containers from 5-pound to 50-pound cartons. 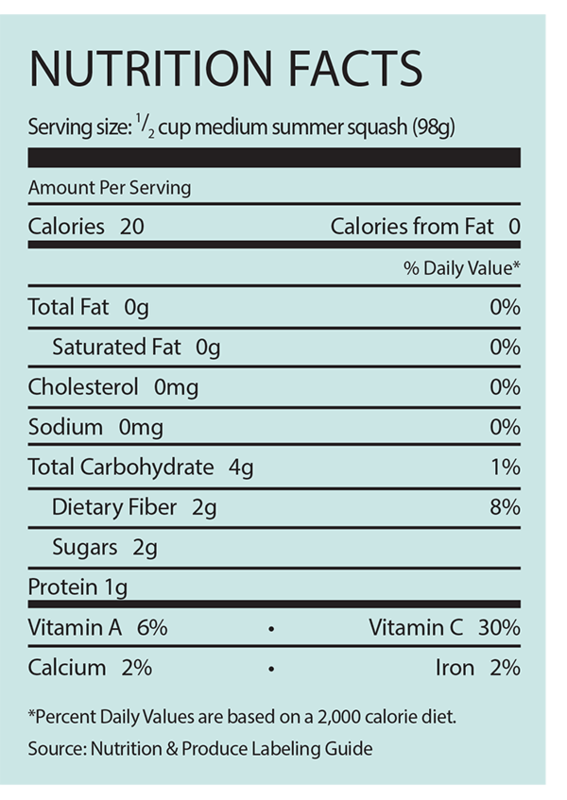 • Summer squash can be held at 32 to 40 F, 0 to 4.4 C for periods of less than four days. Use immediately after removing from refrigeration. • Table queen and delicata will keep up to one month at 50 to 55 F, 10 to 13 C.
• Scallopini squash is more perishable. Refrigerate and use promptly. • Do not can or freeze raw hard-shelled squash. However, cooked squash freezes well. Summer squash that has been frozen will turn to mush due to high water content. • Refrigeration will change the flavor and texture of hard-shelled squash and high temperatures will cause deterioration. 13% of consumers who purchased squash said they exclusively purchased organic squash. Another 16% of those who bought squash said they purchased both conventional and organic squash.